I never could figure out why there were people who flaunted their ignorance, rudeness, and stupidity. To look at some of these fools, you would think they were getting paid to be clueless and cruel. I never understood why it is that dumb is cool, smart is lame, being a jerk gets you places, and being a humanitarian is a loser’s bet. But then, I never could figure out why most people act the way they do. There are times I think those who would be considered mentally stable are the ones who actively work against their best self interests. It used to be far more frustrating than it is now. It doesn’t bother me much now that I’ve just accepted that many people I meet are going to be stupid and mean. I really try to keep my wisdom to myself if I sense my advice will fall on deaf ears. It is tough as the intelligence finds ways to pop up at the worst times. I’ve been accused of being a ‘show off’, a ‘know it all’, and even intimidating simply because the intelligence doesn’t stay hidden for long. But it doesn’t really bother me anymore that people are going to do stupid and rude things. The outside world is messed up but I don’t have to be. I consciously choose not to be messed up. The fact I consciously choose my actions and thoughts puts me far ahead of the bulk of humanity. I’ve seen far too many people who go thorough life just drifting along and not really examining what they can do or what they want. After much trial and error, I’ve come to the conclusion that I’ll never do well at a traditional type of job. It seems anymore that my best chances of having any kind of purpose or money that a traditional job would give people will be through something internet based. Which is fine with me as I never could stand being told what to do and how to think. I think many people with anxiety problems and social awkwardness would do well with an internet based set up. I try not to let stupid and rude people get to me. I’m not perfect at it. But I’ve gotten to where I no longer envy or resent them. 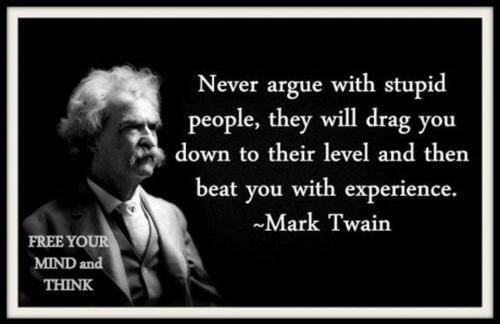 Most of the people that act stupid and rude are not interesting or thought provoking. They are not rare. I choose to be conscious of what I do and think. I choose to be different. I choose to stand out. I choose to not be stupid and rude. Great and true quote. Thanks, I need to be reminded about that. I loved reading this post today. You sure hit it right on – and the quote is excellent here, too. Anyone who has any sort of disability or is outside the “norm” can attest to what you have said – I am a member of the blind community (for the past 7 years) and believe me, I SEE it ever day!